On December 27th, 2014 my son, Steven, and I departed the U.S. for Vietnam!! We were taking a trip filled with nostalgia to the areas of Vietnam where I served during my first tour (Aug 66-Aug 67) and my second tour (June 70-June 71) with the United States Army as a helicopter pilot. We spent about 8 days in DaNang and toured many familiar and some new places in that area which had been I Corps during the Vietnam war. 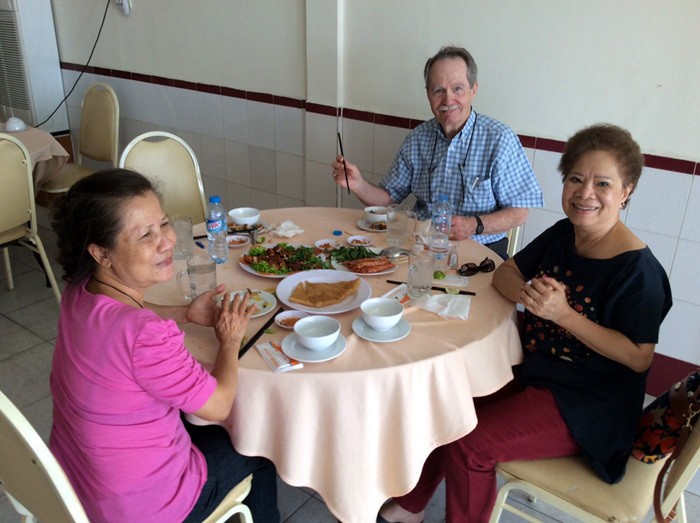 In Da Nang we met a U.S. Vietnamese family the Grandmother I had known during my first tour (66-67). Their group of six Vietnamese was Teresa Vo (Miss Ha), her husband Paul, their daughter Jacqueline and her husband Quan plus their two daughters Catherine and Caroline. The whole family is now U.S. Citizens and all live in the San Jose, CA area. After our time in DaNang we flew to Saigon where we witnessed the huge growth of the area and visited much of the southern half of the country where I had flown during my first tour. One day Teresa (Miss Ha Ha) along with Steve and I rented a driver and car to take us back to Bien Hoa about 35 miles NE of Saigon where I had spent a year with the 118th AHC "Thunderbirds". Teresa had kept in contact for all the years since she had left with another Vietnamese lady who also worked with Teresa at the 118th Operations office of the "Thunderbirds" and her name was Ngyuen Thi. Her nickname back in the 66-67 time period was Miss Ti Ti because she was even shorter and smaller than Teresa! 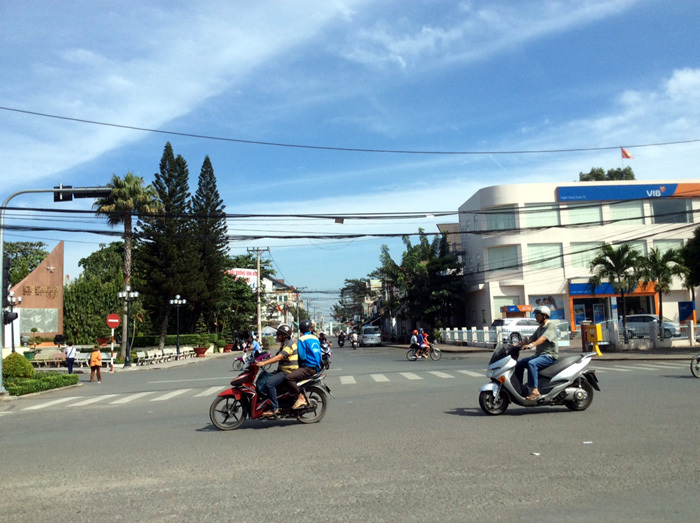 Below are some photos of Bien Hoa today and the places, streets and land marks still identifiable from almost 50 years ago. Miss Ti Ti knew exactly where to go to find them. She led us down "Memory Lane" as we found and identified the building where we lived on Cong Ly Street. 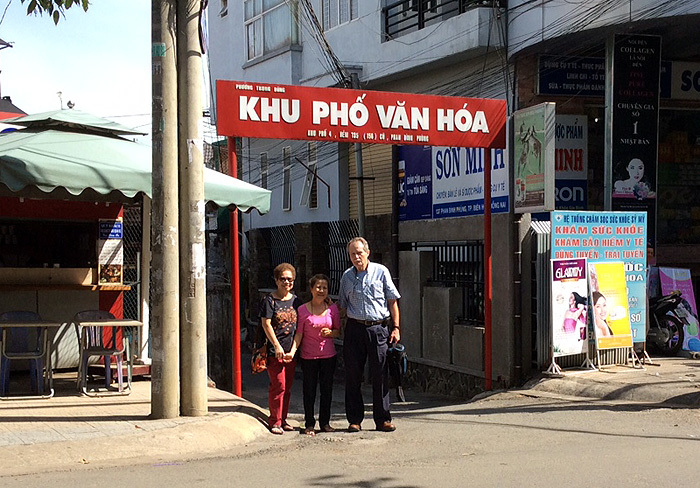 The street has been renamed and it is Vo Thi Sau. Miss Thi Thi told us that she very much wanted to immigrate to the U.S. after 1973, but her attempts were unsuccessful. So, she remained in Vietnam to help her parents and run the family business of a small print shop. Miss Ti Ti never married because, as she told us, her boyfriend/fiance, who was a VNAF pilot, was lost in Cambodia and never found. She said that he was the only one she had wished to marry. 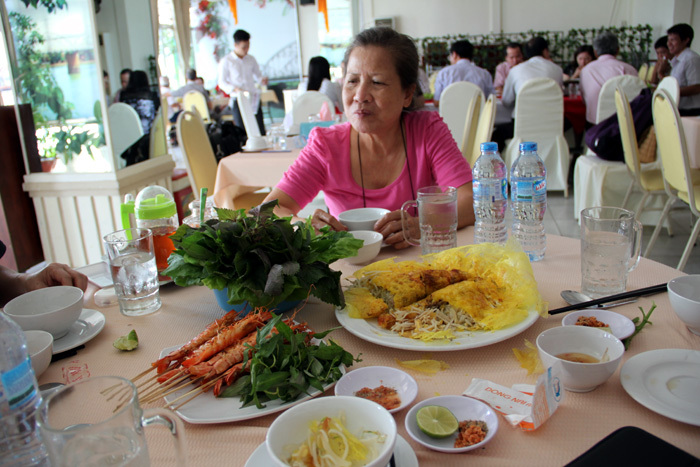 Below are some of the pictures taken in Bien Hoa that memorable day. See if you can remember some of the places from your memory. We did find Cong Ly Street where the officers of the 118th lived from early 1964 until immediately following the Tet Offensive of 1968. 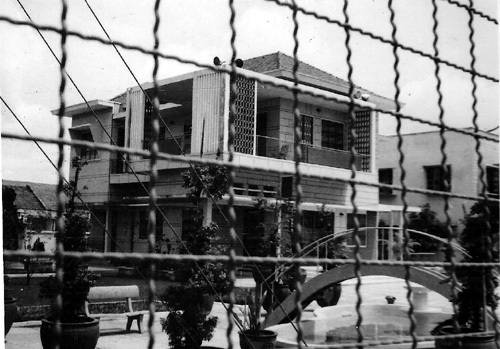 After that they were forced to move back onto the Bien Hoa Air Base where they had lived initially. As you can see, some of the buildings of nearly 50 years ago are still identifiable. In all we spent 18 days in Vietnam and had a wonderful time, especially with the Vietnamese family. The country is "exploding" in capitalism and free enterprise. Of course, the government is a dictatorship which embraces a capitalistic economy and they are encouraging investment in the country especially by the Japanese, Koreans and Chinese plus some European countries. High rise office buildings as tall as 50 stories are now present in Saigon (Ho Chi Minh City). In DaNang as well as Saigon, there are many hotels and office buildings in the 20 story size. Hordes of scooters and many, many cabs fill the streets "honking" to clear the way as they hurry to their destinations. So many of them are present in Saigon that most of the scooter riders wear surgical masks to reduce the intake of fumes and pollutants. The agriculture is much more diversified now. The old "Pappason and Water buffalo" are almost non-existant. They usually grow and harvest as many as three rice crops a year in the southern part and the MeCong Delta areas of Vietnam. In addition they also raise corn, mushrooms, wheat, alfalfa and many other crops not present 50 years ago. The rubber plantations today are even larger, especially around the large flood control lakes in the Tay Ninh and Xuan Loc areas. Steve and I returned to the U.S. on January 15th. The flight is still very, very long, as you will remember. However, the service and amenities on-board are much better now and the comfort was much improved. In all it took 19 flight hours going and only about 15 returning via Tokyo to Los Angeles. very near the old theater and traffic circle. 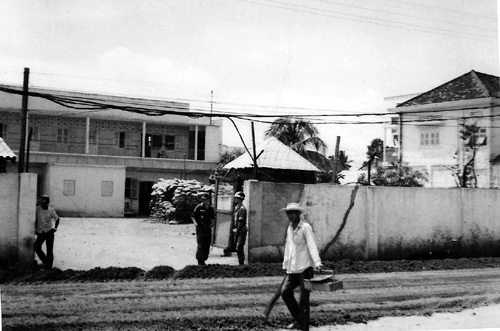 the Bien Hoa Air Base. Cong Ly street looking West toward the river. 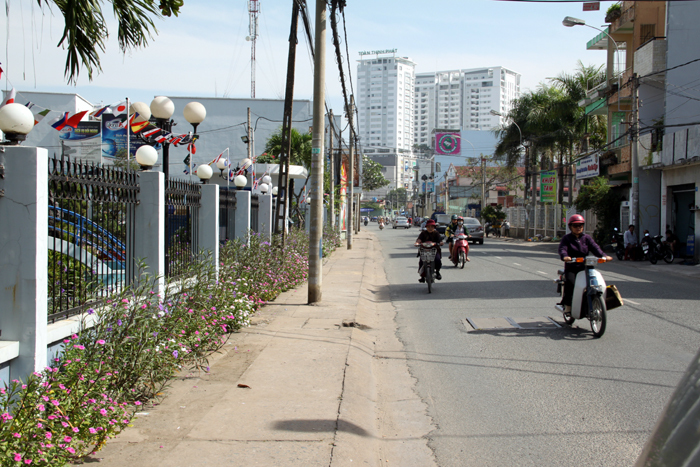 renamed Vo Thi Sau street. The fancy, fenced General ? home that was across the street from the 118th "Thunderbird" Villa. Today it is the Dept of Foreign Affairs for the government. The building beneath the two Communist flags and behind the long blue sign is where the 118th Commander stayed upstairs and the Thunderbird Lounge was on the first floor. 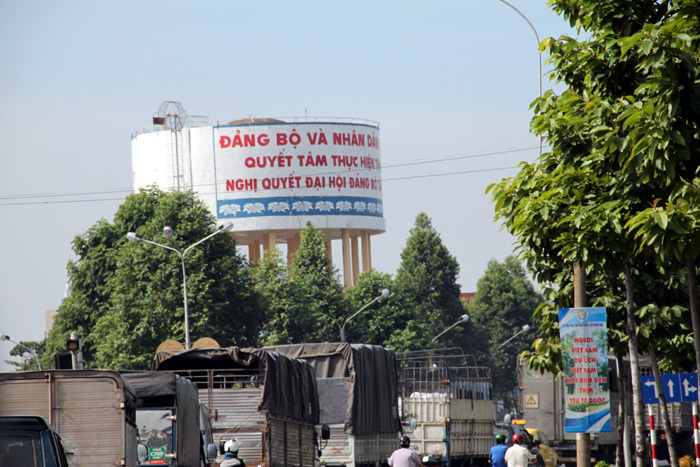 The tall building with the three long louvered widows in front is where the 145th HQ and the 197th AWC personnel lived on Cong Ly Street. 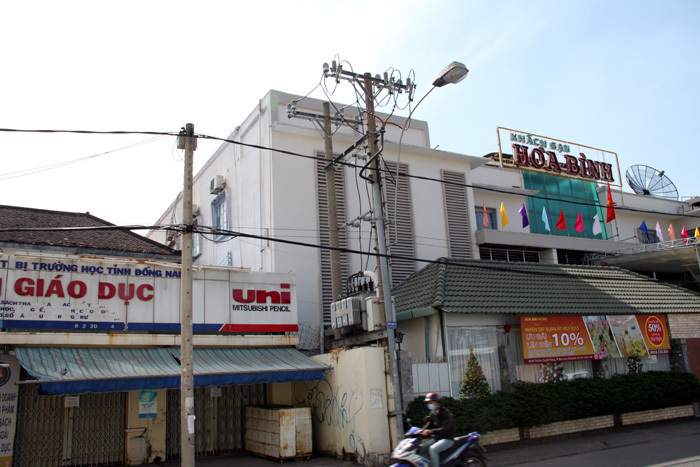 As you can see from the sign on top of the building it is now a 48 room hotel called Hoa Binh. 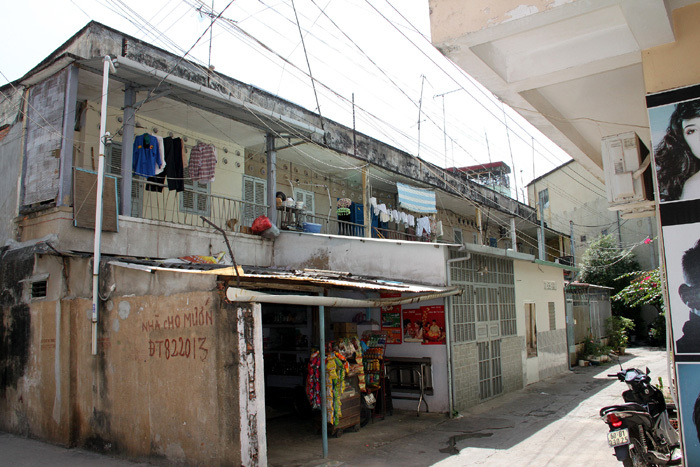 The building above the clothing shop with the wash hanging on the line on the balcony is where the 118th Bandits lived upstairs and the 1st Platoon lived down stairs. Remember the louvered doors and windows plus the two rows of round glass decorative pieces above the upstairs windows? in front of the General ? fenced house. 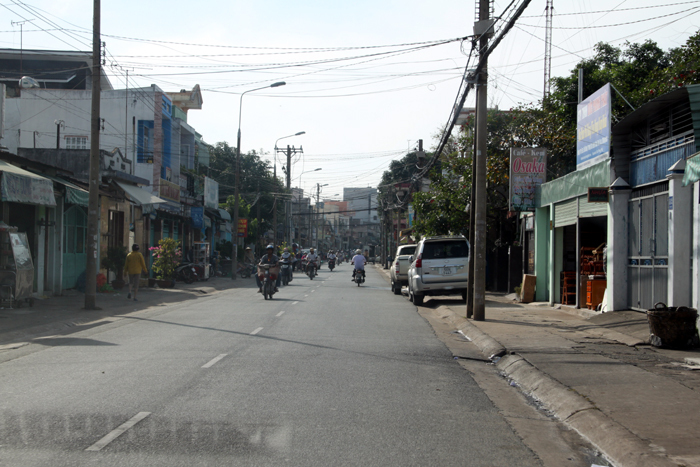 This street is now named Vo Thi Sau street. 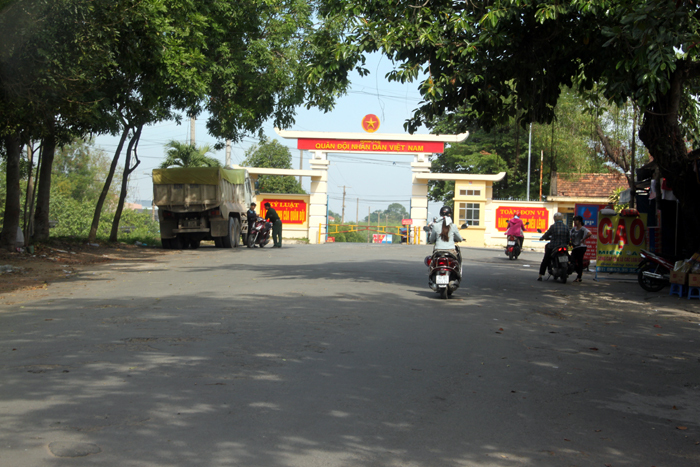 The Bien Hoa air base gate near the tall water tower where we entered the base some 50 years ago. Much of the air base has been abandoned, but the original "Bird Cage" runway is still visible on Google Earth. entrance to the "alley" walk to Miss Thi's house. 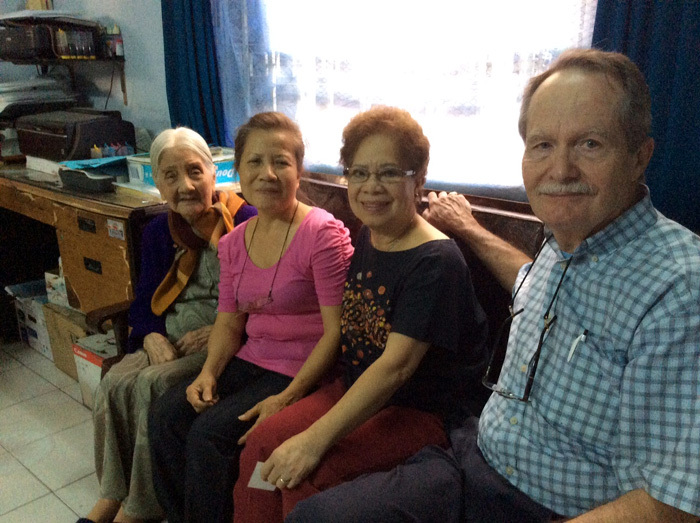 L to R: Miss Thi's Mom(95 years), Miss Thi, Miss Ha and Tom Payne sitting in the home of Miss Thi. 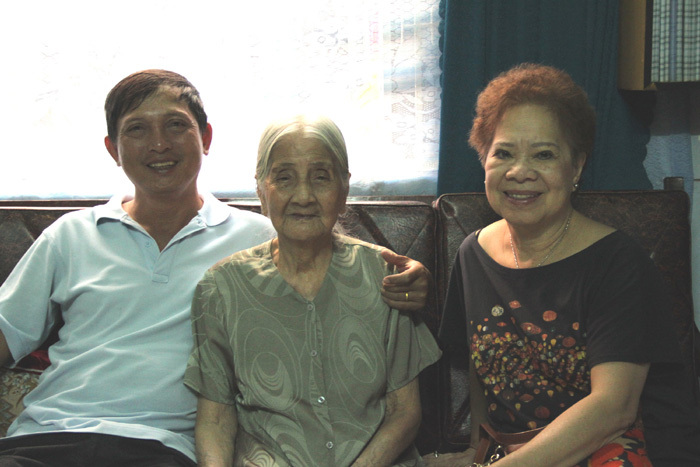 L to R: Miss Thi's brother, Miss Thi's Mom and Miss Ha. 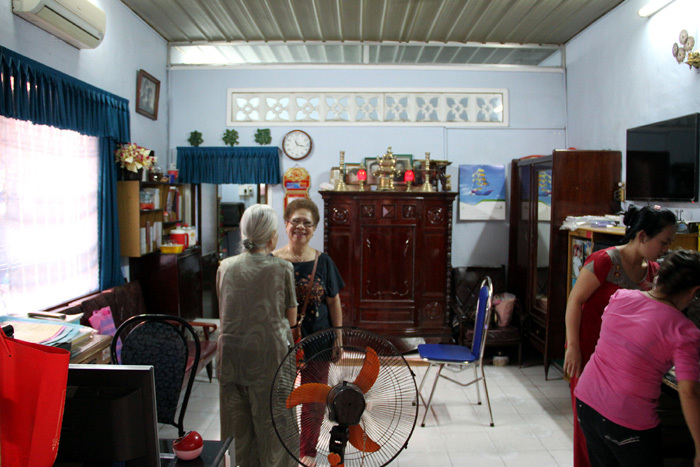 Inside Miss Thi's house which is two rooms. Note the air-conditioner high over the window, but apparently not used unless very, very hot. Miss Thi as we ate a wonderful Vietnamese meal with fried prawn, rice, noodles, greens and rice buns at the Song Dong Nai Restaraunt which sat beside the Song Dong Nai River. Song Dong Nai river in Bien Hoa. 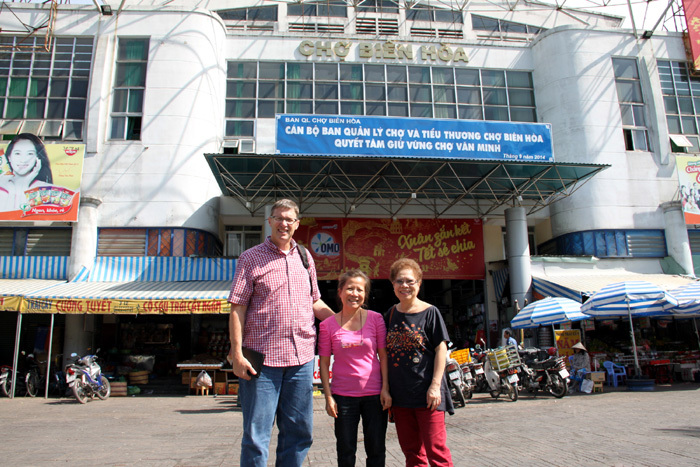 L to R: Steve Payne, Miss Thi Thi and Miss Ha Ha standing in front of what used to the open air market of Bien Hoa. All enclosed now with an escaltor to the second floor(that was not operating) it is a busy place with all kinds of shops and even public bathrooms!! 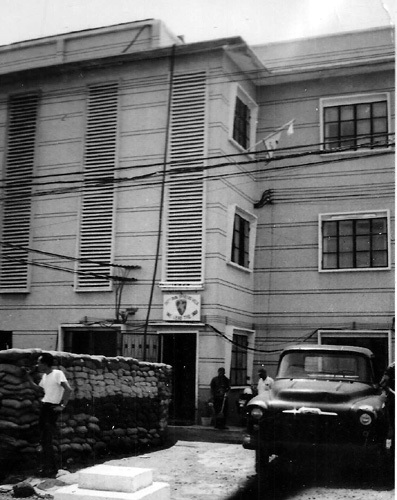 Now, some of you may question that we actually found and saw the original buildings where the officers of the 118th Thunderbirds lived on Cong Ly street, I have included some photos from 1966-67 below so you may make some comparisons. 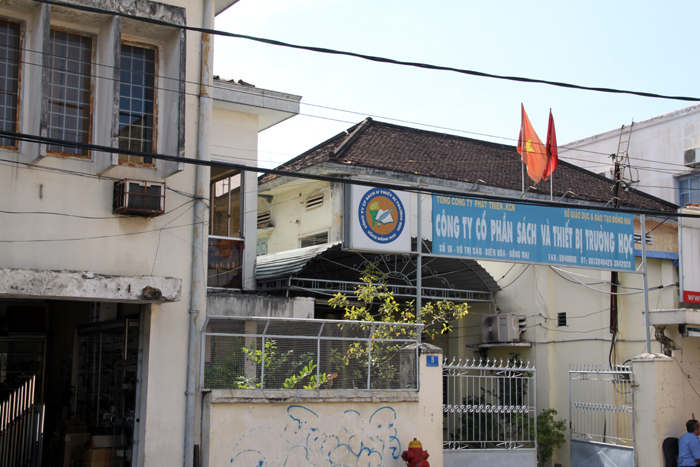 I think you will agree the buildings we saw were the very same buildings from 50 years ago all on Cong Ly Street in Bien Hoa!! 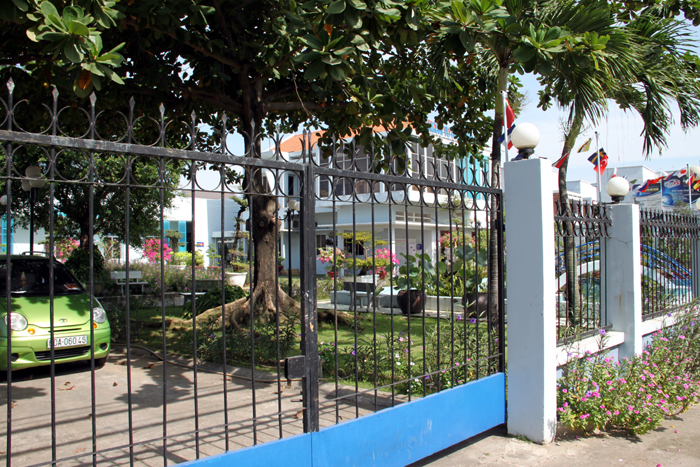 Entrance to the 118th Villa on Cong Ly street. Photo taken from balcony of the Bandit building showing the CO's quarters above the Thunderbird Lounge. 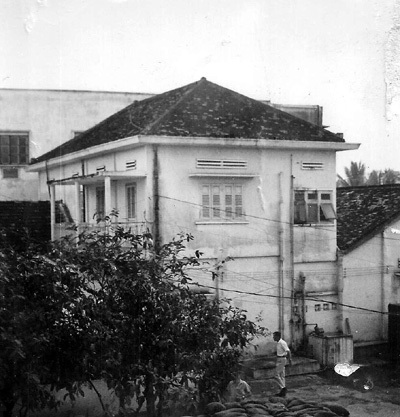 Also, the building in background was the 145th Villa next door. All on Cong Ly street. which we all thought was a General's house? Not sure who lived there in 66 as well as today. to the 118th Villa on Cong Ly street.